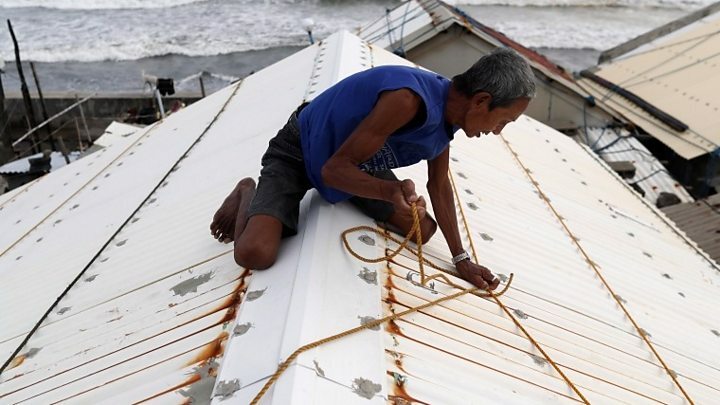 Super Typhoon Mangkhut has gathered strength as it barrels towards the Philippines, weather officials say. The storm is now packing winds of 255 km/h (160 mph) and officials say more than five million people are directly in its path. Last-minute preparations are under way before it makes landfall on the northern tip of the main island of Luzon by Saturday. Flights have been cancelled, schools shut and the army is on standby. Officials have said that the storm, which is 900km in diameter, will be powerful enough to remain a “considerable threat” even if it slows down before making landfall. The storm – known locally as Ompong – has already pummelled the Northern Mariana Islands and Guam. Authorities say they expect storm surges of up to 7m (23 feet) and are warning that heavy rains could trigger landslides and flash floods. Storm warnings have been issued in 39 provinces and sea and air travel has been restricted. National Disaster Risk Reduction Management Council spokesperson Edgar Posadas told local media that 5.2 million people were expected to be affected, including a million people who live below the poverty line. “During previous monsoon rains, half of our house was destroyed so I wanted to take my grandchildren to safety,” she told journalists. The Philippines is routinely hit during the typhoon season. The deadliest storm on record in the country was Super Typhoon Haiyan, which killed more than 7,000 people and affected millions in 2013. Residents of this small, low-rise town say they’ve been through this before, they’ve seen other storms. Farmers are working around the clock to harvest their rice paddies. They say the rice is still not ripe, but want to salvage what they can before this storm potentially devastates their fields. Authorities have told people to move on. Some cars are leaving the area, bedding on the roof – but some people say they want to stay inside their homes to prevent thieves entering. Other countries have also been making preparations. In China, authorities have raised storm alerts to “yellow”, which is the second level on its four-tier warning system. It is predicted to hit China between late Sunday and the early hours of Monday. In Hong Kong preparations are already under way, though the latest forecasts suggest Mangkhut will pass to the south of the territory later in the weekend.